09.02.2017 Фильм недели: "The Lord of the Rings"
Мы продолжаем узнавать ваше мнение о самых разных фильмах. На этой неделе на нашей доске объявлений идет "булавочное" обсуждение трилогии "Властелин колец". Вы наш ученик или гость? Выберите самую яркую булавочку и расскажите, смотрели вы фильм недели или нет и дайте ему оценку от 1 до 5 звезд. 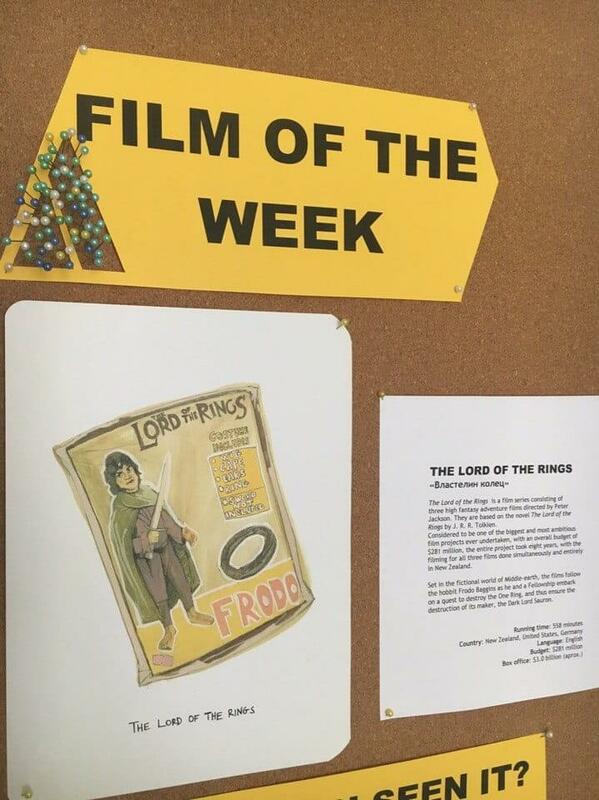 "The Lord of the Rings" is a film series consisting of three high fantasy adventure films directed by Peter Jackson. They are based on the novel The Lord of the Rings by J. R. R. Tolkien. Considered to be one of the biggest and most ambitious film projects ever undertaken, with an overall budget of $281 million, the entire project took eight years, with the filming for all three films done simultaneously and entirely in New Zealand. Set in the fictional world of Middle-earth, the films follow the hobbit Frodo Baggins as he and a Fellowship embark on a quest to destroy the One Ring, and thus ensure the destruction of its maker, the Dark Lord Sauron.